The Ways of the Wayments: Bed rest bites! Yay! I'm so glad you have a blog! It's so fun, and you are so cute! You're not fat either! I'm excited for you! Let me know when you have your baby! Oh, and come visit my blog! 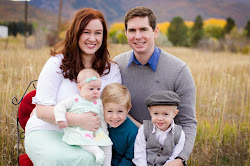 I am so excited to get to see your little family through your blog! Good luck with the rest of your pregnancy. Being a mom is great! Yeah a blog, I am so excited. I am also so excited that you are having a baby and a boy, boys are great to have first. Although you may not think so because you had a crazy older bro, j/k. Anyways, glad the baby is still in you and good luck with everything. by the way I love the name Grayson, so cute. Well, at least you know how I feel at the beginning of bed rest. You are so lucky to be at the end. I can't wait to see your baby. Can I mush him?